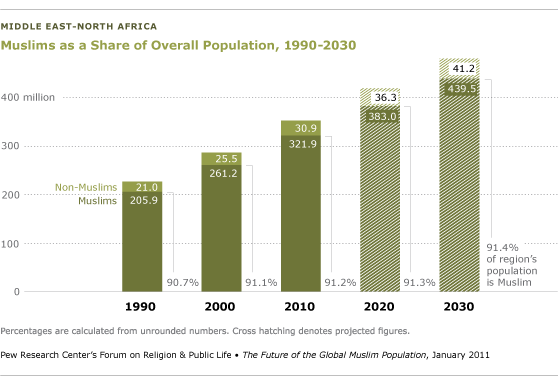 The Muslim population in the Middle East-North Africa region is expected to grow by more than a third (37%) in the next 20 years. It is projected to grow from 321.9 million in 2010 to 439.5 million in 2030, which is more than double the number of Muslims in the region in 1990 (205.9 million). Roughly nine-in-ten people living in the region today are Muslim (91.2% in 2010). This proportion has held fairly steady for the past 20 years and is not projected to change very much in the next 20 years. 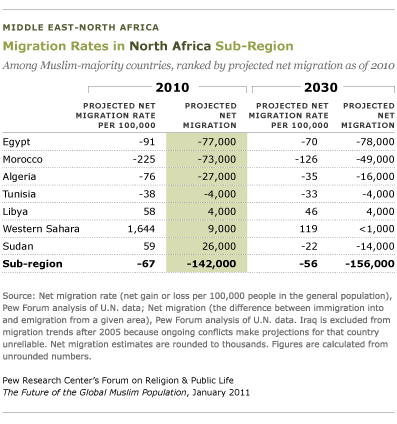 A fifth of the world’s Muslims (19.9%) now live in the Middle East-North Africa. 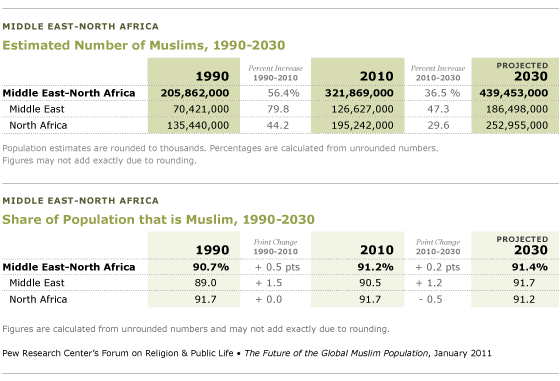 The region’s share of the global Muslim population is expected to be roughly the same in 2030 (20.1%). The number of Muslims in the Middle East-North Africa is expected to increase by about the same amount in the next 20 years (117.6 million) as it did in the previous 20 years (116 million). 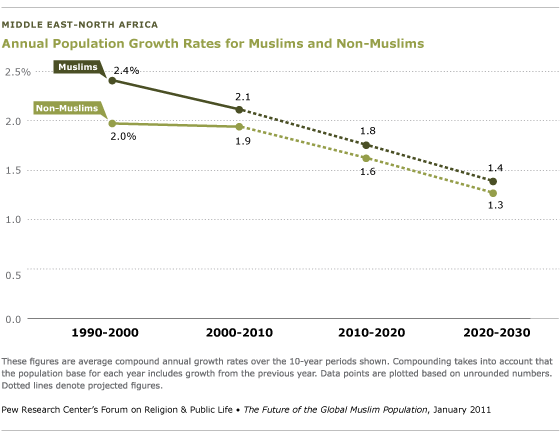 However, because the beginning population base in 1990 (205.9 million) was smaller than the beginning base in 2010 (321.9 million), the projected addition of 117.6 million Muslims from 2010 to 2030 would amount to a slowing rate of growth. The annual growth of the Muslim population in the region is projected to be 1.4% between 2020 and 2030, down from 1.8% between 2010 and 2020 and 2.1% between 2000 and 2010. 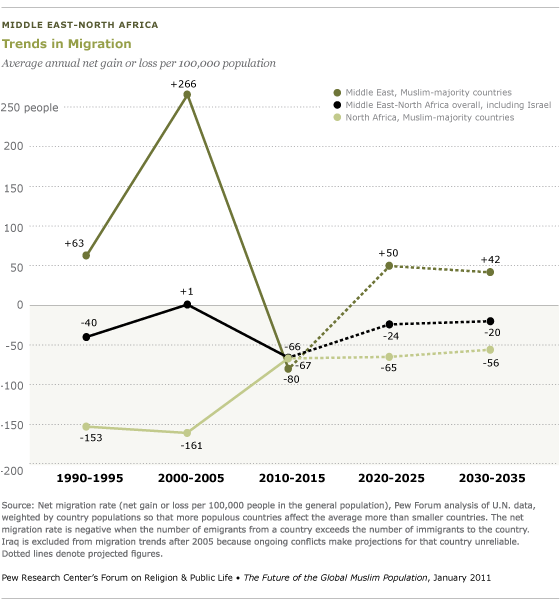 The Muslim population in the Middle East has been growing at a faster rate than the Muslim population in North Africa.28 From 1990 to 2010, the Muslim population in the Middle East increased by roughly 80%, from about 70 million to 127 million. During the same period, the Muslim population in North Africa increased by about 44%, from 135 million in 1990 to 195 million in 2010. The number of Muslims in the Middle East will continue to grow at a faster rate than the number of Muslims in North Africa, largely because Muslims in the Middle East have a higher fertility rate than those in North Africa. But neither sub-region is expected to grow as fast in the next 20 years as it did in the previous two decades. Between 2010 and 2030, the Muslim population in the Middle East is projected to increase by about 47%, from 126.6 million to 186.5 million, while the Muslim population in North Africa is projected to grow by about 30%, from 195.2 million to nearly 253 million. The size of the Muslim population in North Africa reflects the large number of Muslims living in Egypt, which is home to roughly one-in-four Muslims in the region. Egypt’s Muslim population is projected to increase by 25 million in the next 20 years, from 80 million in 2010 to 105 million in 2030 – by far the largest numerical increase of any country in the region. Although Egypt’s Muslim population is expected to grow significantly in absolute numbers in the next 20 years, Egypt is expected to drop from having the fifth-largest Muslim population in the world to having the sixth-largest by 2030, behind Pakistan, Indonesia, India, Bangladesh and Nigeria. This is largely because Egypt is expected to have much lower fertility rates than Nigeria over the next two decades. Algeria and Morocco currently have the second- and third-largest Muslim populations, respectively, in the Middle East-North Africa region. By 2030, however, Iraq is expected to move into the second spot, largely because it has a substantially higher fertility rate than Algeria and Morocco (see section on fertility in the Middle East-North Africa section.) Iraq’s Muslim population is projected to increase from 31.1 million in 2010 to 48.4 million in 2030. Algeria’s Muslim population is expected to reach 43.9 million in 2030, up from 34.8 million in 2010, giving it the third-largest Muslim population in the region in 2030. Morocco will fall from third place to fifth; its Muslim population is projected to grow from 32.4 million in 2010 to 39.3 million in 2030. Sudan (as currently demarcated) is expected to have the fourth-largest Muslim population in the region in 20 years. Yemen’s Muslim population is projected to increase by 62%, from 24 million in 2010 to 39 million by 2030. 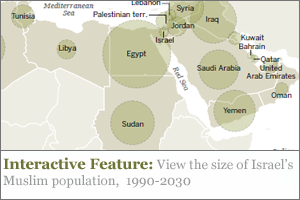 The Muslim populations in Iraq and Western Sahara are projected to increase by 55%. Of the five regions covered in this report, the Middle East-North Africa will continue to have the highest percentage of Muslim-majority countries. Of the 20 countries and territories in the region, all but Israel are projected to be at least 50% Muslim in 2030, as is the case today. During the past 20 years, the Muslim population in Israel has more than doubled, growing from 0.6 million in 1990 to 1.3 million in 2010, a 103% increase. In the next 20 years, Israel’s Muslim population is projected to increase by 66%, from 1.3 million in 2010 to 2.1 million in 2030. (Israeli population numbers include Muslims living in Jerusalem but not Muslims living in the West Bank and Gaza. )Israel is the only country in the region where Muslims are currently in the minority. 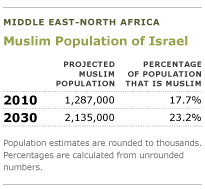 The Muslim share of Israel’s population is projected to increase from 17.7% in 2010 to 23.2% in 2030, a 5.5-point increase. 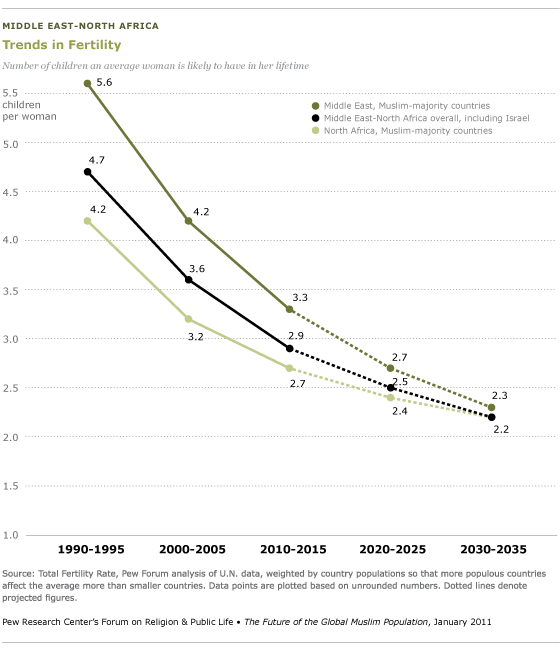 This compares with a 3.6-point increase between 1990 and 2010, when the Muslim share of the population rose from 14.1% to 17.7%.One reason the Muslim population in Israel is increasing so rapidly is because Muslim women in the country are relatively young and many are in or about to enter their prime childbearing years. In 2008, the median age of Muslim women in Israel was 19, compared with 32 for Jewish women, which reflects the overall youthfulness of Israel’s Muslim population. Two-thirds of Israeli Muslims are under age 30, according to an analysis of 2009 data from Israel’s Central Bureau of Statistics. Slightly less than half of Jews and other religious groups are in this age category. The youthfulness of Israel’s Muslim population is evident in the graph at right, which shows that about 40% of Israeli Muslims are under age 15. By comparison, about a quarter of Jews and others (which includes Christians, Druze and those not reporting a religious identity) are in this age group. On the older end of the age spectrum, 15% of Muslims are age 45 and older, compared with about 33% of Jews and 27% of others. Nearly a fifth of Jews in Israel (16%) are age 60 and older, compared with only 5% of Muslims. Some segments of the Muslim population in Israel continue to have extremely high fertility rates. For example, Muslim Bedouins from the Southern District, which extends to the Gulf of Aqaba, have about eight children per woman on average. Nevertheless, the average fertility rate among Muslim women in Israel has declined significantly, from a high of about nine children per woman in 1960 to about 3.8 children per woman in 2010. But it is still significantly higher than the average fertility rates for Jewish and Christian women in Israel (2.9 and 2.1 children per woman, respectively). This is the case even though some non-Muslim groups within Israel, including certain groups of Orthodox Jews, also have relatively high fertility rates. There are six administrative districts within Israel. More than a third of Muslims in Israel (37%) live in the Northern District. A fifth (21%) live in the Jerusalem District, which includes both East and West Jerusalem. Most of the remainder of Israel’s Muslim population live in the Southern District (15%), the Haifa District (14%) and the Central District (11%). Only 1 percent of Israel’s Muslims live in the Tel Aviv District. As recently as 1990-95, women in Muslim-majority countries in North Africa had far fewer children on average (4.2 children) than women in Muslim-majority countries in the Middle East (5.6 children). There is now much less of a difference. 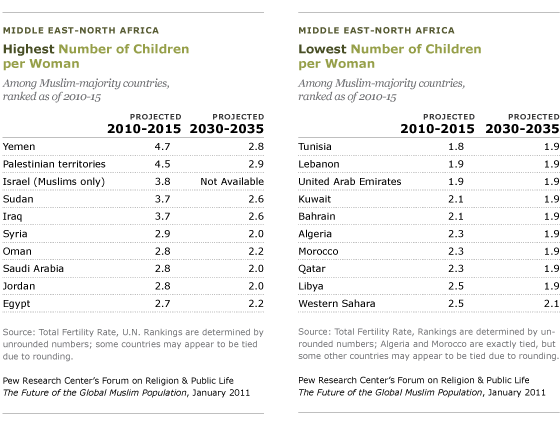 In 2010-15, a woman in Muslim-majority countries in the Middle East is expected to have an average of 3.3 children in her lifetime while a woman in Muslim-majority countries in North Africa is expected to have an average of 2.7 children. By 2030-35, fertility rates in the two sub-regions are expected to be essentially the same. Most of the countries in the region with the highest fertility rates are in the Middle East. Yemen tops the list, with an estimated 2010-15 fertility rate of 4.7 children per woman. Average life expectancy at birth has been rising in this region in recent decades, from approximately 65 years in 1990-95 to about 71 years in 2010-15. 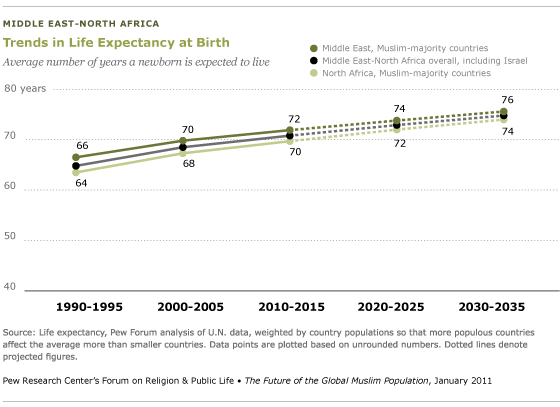 Life expectancy at birth remains slightly higher in the Muslim-majority countries in the Middle East than in the Muslim-majority countries in North Africa. This is another reason the Middle East’s Muslim population has been growing at a faster pace than the Muslim population in North Africa. The life expectancy gap between the two sub-regions is projected to narrow to 1.6 years by 2030-35. 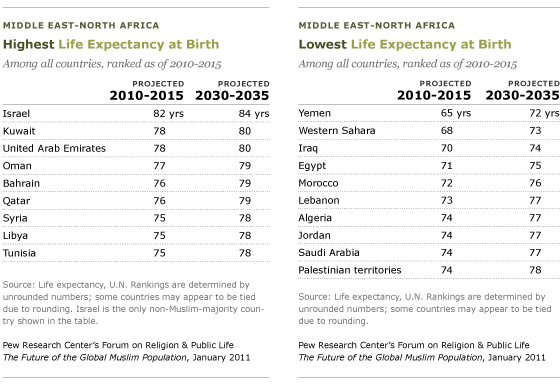 Of the Muslim-majority countries in the region, Kuwait and the United Arab Emirates are expected to have the highest life expectancies at birth in 2010-15 (78 years), while Yemen and Western Sahara are projected to have the lowest (65 and 68, respectively). However, Yemen and Western Sahara are expected to have the largest gains in longevity in the region by 2030-35. 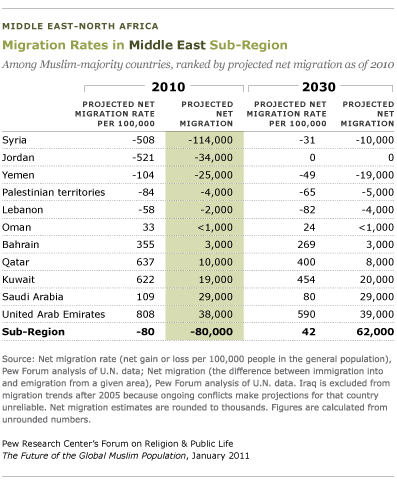 On average, more people are leaving countries in the Middle East-North Africa region than migrating to them. From 2010 to 2015, these countries collectively are expected to lose an annual average of 66 people per 100,000 in the general population. During the same period, Muslim-majority countries in North Africa are expected to have an annual net loss of 67 people per 100,000, which works out to be more than 142,000 people per year. The sub-region is projected to lose 56 people per 100,000 annually in 2030-35, or more than 156,000 people per year. In contrast with North Africa, Muslim-majority countries in the Middle East gained population in the 1990s and early 2000s. Many of the immigrants coming to the Middle East during this period went to the oil-rich Gulf states in search of economic opportunities; other immigrants included people returning to Iraq following the first Gulf War. However, the Middle East is projected to have an annual net loss of 80 people per 100,000 in 2010-15, or more than 80,000 people per year. This loss reflects the impact of the recent world economic downturn, which has reduced immigration to the Gulf states, and the continuing conflict in Iraq, which has increased migration in the region as a whole. However, Iraq is excluded from the migration trend projections after 2005 because the ongoing conflict there makes projections regarding migration from the country unreliable. The course of the conflict in Iraq also has implications for migration from neighboring countries such as Syria and Jordan. The U.N. estimates shown in the table on page 101 are based on the assumption that, by 2015, substantial numbers of refugees will be returning from Syria and Jordan to their homes in Iraq or going elsewhere. Projecting the impact of migration on the religious composition of the Middle East is complicated. For example, increased emigration could add to the overall share of Muslims in the region if religious minorities leave in greater proportion than Muslims do, as is now the case in Iraq.29 Conversely, if immigration to the Gulf states were to decrease, this could have the effect of reducing the non-Muslim share of the population, since substantial numbers of immigrants to this part of the Middle East are non-Muslims from countries in South Asia and Southeast Asia, such as the Philippines and India. As fertility rates in the Middle East-North Africa drop and life expectancies rise, the Muslim population in the region is aging. The median age in the region has risen by five years in recent decades, to 24 years. It is expected to rise by about another five years in the next two decades, to 29 years. Muslim-majority countries in North Africa have somewhat older populations than Muslim-majority countries in the Middle East. 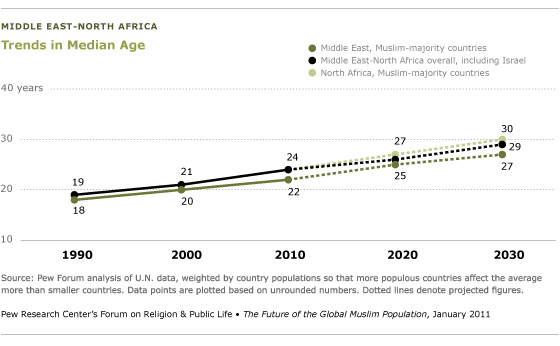 By 2030, the median age of the Muslim population in North Africa is projected to be 30 years, compared with 27 years for Muslims in the Middle East. The fact that Muslim-majority countries in the Middle East have a more youthful population than those in North Africa – and therefore more women in or about to enter their prime childbearing years – helps explain why the Middle East is expected to have a faster rate of population growth than North Africa. Although the population in Muslim-majority countries in the Middle East-North Africa is aging, it is expected to remain relatively youthful. In the Middle East, about 54% of the population in Muslim-majority countries is expected to be under age 30 in 2030; in North Africa, about 49% of the population in Muslim-majority countries is expected to be in this age bracket in 20 years. In Israel, by comparison, the U.N. estimates that about 43% of the general population, which includes a growing share of Muslims, is expected to be younger than 30 in 2030.